Colour: Sandy brown. Lion cubs sometimes show darker spots. Fossil remains of lions have been found in Europe in rocks about half a million years old. These lions were much larger than the lions of today. The last lions in Europe died out about 2000 years ago. Lions were common in Asia until the 1800s, but now only a few hundred Asiatic lions survive in the Gir Forest, India. Lions live in family groups called prides. Adult male lions are often larger and heavier than female lions (lionesses), and they have thick manes which get darker as the animal gets older. 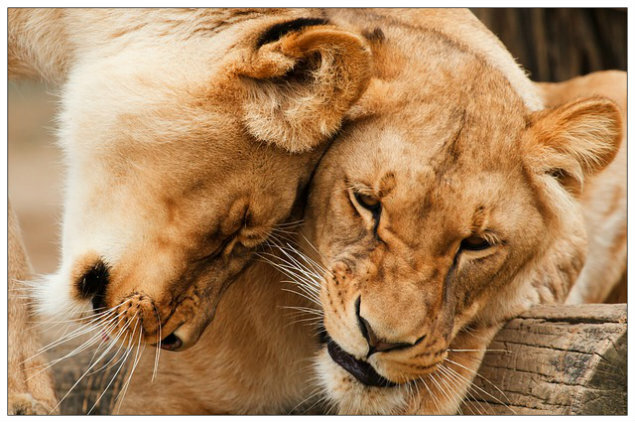 Each pride is dominated by an adult male lion. Prides of lions move around their territories feeding on antelope, zebra and buffalo. The lionesses do most of the hunting, often working together to overcome their prey. Lions don’t usually move about too much during the heat of the day. They can rest for 20 hours a day or more, and typically spend 2 hours per day walking (following herds of grazing animals) and under an hour feeding. Lion cubs, born in a litter of three or four, have spotted coats to make them harder for predators to find. After six or seven weeks, lion cubs are big enough to run with the pride. Although lions might look soft and cuddly, they are ferocious and very dangerous. Hundreds of people are killed by lions each year. A white lion is a lion with a paler creamy colouration. They are not albinos (as they have the same eye colour as other lions). Their pale coat is caused by a recessive gene. Lions are able to breed with some of the other types of big cat. The offspring of a lion and tigress is called a liger. The cub of a tiger and lioness is called a tigon. If a lion breeds with leopard, a leopon is produced.